The Association is holding it's AGM and everyone is invited to attend. Come along and find out what happens at the community centre, how it is run, give us your ideas of what you'd like to see at the centre. Refreshments will be served. 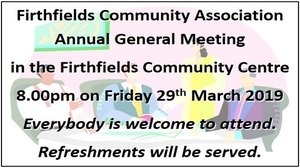 If you would like to raise any item under 'Any Other Business' at the meeting, this must be sent to The Secretary at least 14 days before the meeting by email to 'info@firthfields.org' or by post to Firthfields Community.Centre, Firthfields, East Garforth LS25 2HD. 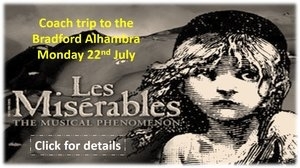 This brilliant new staging has taken the world by storm and has been hailed “Les Mis for the 21st Century”. With scenery inspired by the paintings of Victor Hugo, the magnificent score of LES MISÉRABLES includes the songs 'I Dreamed a Dream', 'On My Own', 'Bring Him Home', 'One Day More', 'Master Of The House' and many more. Coach departs Firthfields Community Centre at 6.00pm prompt. For tickets, email 'info@firthfields.org' or telephone Patrick on (0113) 2864298.